There is much discussion as to how to best recognize, on its upcoming tenth anniversary, the tragic terrorist attack on the United States of September 11, 2001. There were many heroes of that event. My favorite is our friend, John Lynch, a master ironworker by trade, employed at the time by the Port Authority of New York and New Jersey. His actual full-time assignment then, still as an Authority employee, was as president of the union representing the iron workers and such employed by the Port Authority, an arrangement provided for in the union's contract with the Authority. Upon learning of the disaster, John called the shop and had a set of tanks and torches of his favorite type sent to the site for him to use, and he forthwith suited up and joined the ranks of his colleagues desperately trying to penetrate the rubble to find survivors - or bodies. In this photo, taken by a Port Authority official photographer, we see John at this task, which he pursued tirelessly for I don't recall how many days. I'm proud to know you, John. People like John Lynch are the real heroes indeed. You are right to be proud to know him. Thanks for bringing this personal and heroic story to us. 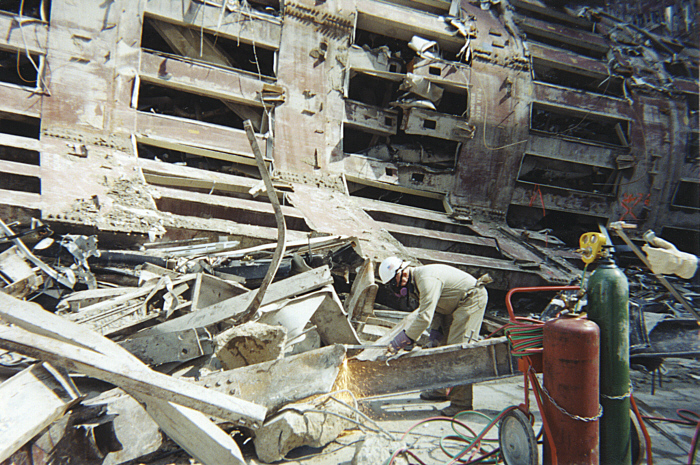 It's unfortunate that the workers, mostly volunteers, who came to rescue the 9/11victims, where themselves exposed to toxic dust and asbestos. It was also sad and disgraceful to see that the Red Cross, although it collected millions of US dollars in donations, failed to distribute any funds for the longest time until Bill O'Reilly on Fox News campaigned to humiliate the organization that was stuffing the funds into long term pensions and contingency planning instead of distribution to the families of the victims. So here we have a dichotomy of response to tragedy. Selfless volunteerism and generosity, on the one hand and selfish pompous, entitled individualism and greed on the other. That remains the paradox as we face new challenges of the second decade of the 21st century. We must cherish the heroes, those who fell in the line of duty, those who volunteered and paid a price with their health and those who are just scarred by the trauma of the unthinkable. You have done your part by reminding us to be grateful and be ready ourselves to follow the example of John Lynch and so many others and serve the public good, as the opportunity arises.